Many of us regularly have family or friends visit from other countries who are keen to try out the local cuisine. 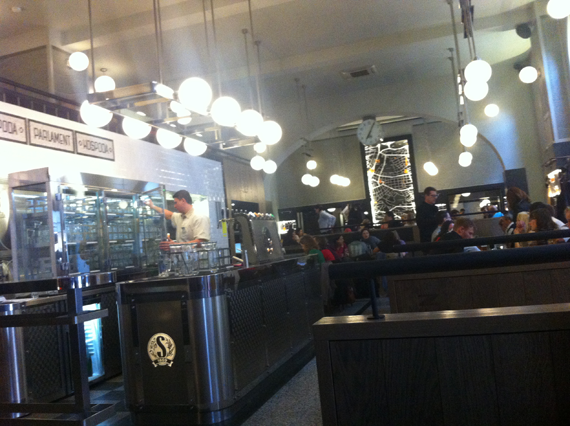 In the past it was tricky, many were smoke-filled dark spaces with deep fryer on overdrive and surly wait-staff. Then along came czech hospoda chain restaurants that challenged others to refine their ambience, quality of food and service levels. One step further is the newish Vinohradský Parlament proving that beer, great food, visitors and kids can all mix in harmony! So this place has been open since July 2013. It’s just behind the church at Náměstí Míru at the beginning of Korunní, easily accessed via metro and tram. The big deal with this restaurant is that it has a whole room dedicated to the kids and that room has a big ball pool and netted play area with tunnels and slides - you can see the room through a window onto the street. The playroom is open from 10.45am to 9pm every day and as well as the netted climbing area there is a play kitchen stocked with toy vegetables, pots and pans and even a pretend beer tap - only in CR! Also, a large craft table with paper, pens and materials, no doubt the kids have supervised craft times with the babysitters on weekends. Parlament is part of the Potrefená Husa chains and is a completely new space designed in the style of a First Czechoslovak Republic pub (circa 1920s-1930s). Tiled surfaces, gleaming brass fixtures and stainless steel surfaces give it that authentic feel - you’d assumed that it had always been here. Bench-style seating is at ground level and above and unlike other hospoda’s the nicer area up front was smoke-free with smoking relegated to other areas quite a distance away as I couldn’t smell it whatsoever. 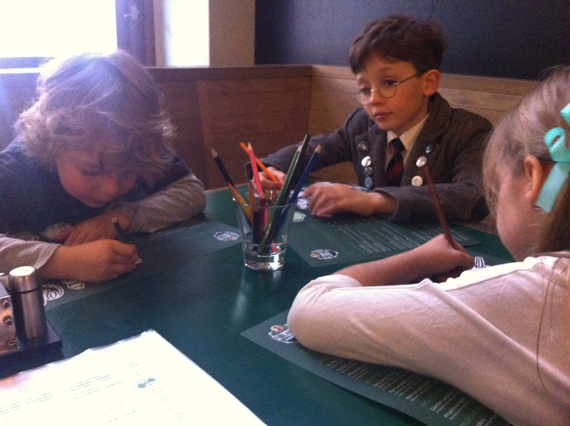 The kids were given their own menu that included sheets to colour in along with pencils - this occupied them for all of 5 minutes whilst we worked out their order, after that they were gone and in full play mode until they reluctantly returned to their seats for their meals. Another cool thing about the kids menu was that they had two portion sizes, say for kids 5 and under and those that are older. Smaller kids meals are priced between 35 and 49czk, Older kids pay 55czk. Kid meals are meatballs, snitzels, chicken soup and hotdogs. They also offer milkshakes and yummy deserts. 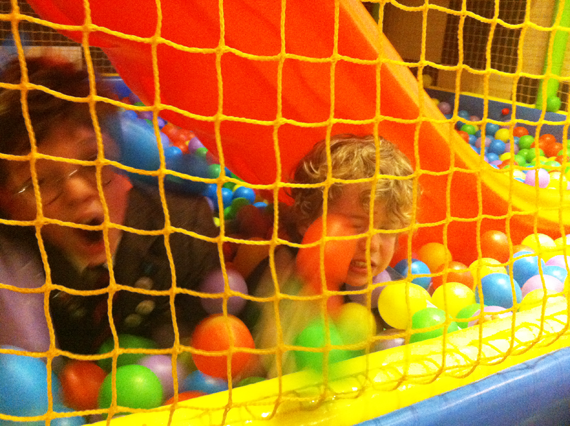 On weekends there are full-time babysitters in the playroom that entertain and look after the kids. The service is free and supervision is from 11.30am till 5pm. For us, the beer was great as were the meals, very fresh and well prepared. Lots of hearty czech specialities - mostly meat dishes with some vegetarian and lighter meal options offered. Like any regular czech restaurant there are lunch specials (from 80 to 130czk for mains) during the weekdays otherwise its a la carte dining from 185czk to 240czk for mains. It’s important to mention Bruxx restaurant around the corner from Vinohradský Parlament. These are sister restaurants so both are connected on the inside and share the kids playroom area. 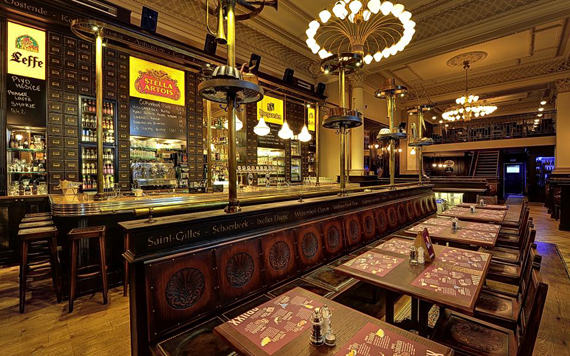 Brux is modelled on a Belgium pub and thus has many different styles of beers and their food speciality is Mussels. So if you want the convenience of the playroom but aren’t in the mood for Czech food then try Belgium! I’ve not been there yet but my friends have and recommend it. More information about Bruxx can be found here (in czech). OPEN: Restaurant open Monday to Wednesday 10.45 till 24.00, Thursday and Friday 10.45 till 01.00, Saturdays 11.30 till 01.00 and Sundays 11.30 till 23.30. Bar open Monday to Sundays from 09:00 till 02:30. DIRECTIONS: By Metro: Take the green line A to Náměstí Míru, it’s the first building on your right when you walk up Korunní Street. By Tram: Take Tram numbers 4, 10, 16 or 22 to Náměstí Míru. By Car: There are some paid parking spots around the Theatre at Náměstí Míru and around the square itself.